It was designed with embedded systems in mind and this makes it easy to port not only to industrial embedded systems, but also to a variety of popular prototyping boards. Pick the board that you are using and check the instructions on how to install and use YAMI4 on that board. Would you like to see instructions for other prototyping boards as well? Just let us know! 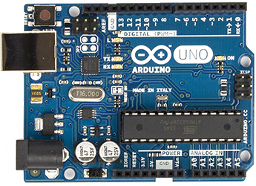 Arduino Uno is a very simple board that itself does not have any networking capabilities, but can be extended with a dedicated Ethernet shield. See how to use YAMI4 on Arduino Uno. Arduino Due is a powerful board based on the ARM microcontroller that is compatible with the Arduino platform. See how to use YAMI4 on Arduino Due. Intel Galileo is a powerful board based on the Intel processor. It is compatible with the Arduino platform. See how to use YAMI4 on Intel Galileo. Raspberry Pi is a popular minicomputer that is based on the Linux operating system. See how to use YAMI4 on Raspberry Pi.